Bordeaux is eponymous as the wine capital worldwide. It persistently remains at the epicentre of fine wine production thanks to its top red Bordeaux flying the standard for the world’s Cabernet Sauvignons. Yet sadly some regard it as having a haughty aloofness and perception that the bourgeoisie can only access and savour the ‘good’ wines. Add into the mix that Bordeaux has 60 appellations, vintage variations, more than its fair share of classifications and terms like ‘en primeur’, claret, Meritage, left bank, right bank and so on, it can appear confusing. Unsurprising then that some decide to stay away from these wines and choose other alternatives. Representationally, Bordeaux fine wine only accounts for a very small percentage of production as there is a broad mix of wine styles from this region that are much more easily accessible and cater for the tastes, and pockets, of the wider populous. Admittedly some of the wines aren’t exactly the easiest to ‘appreciate’ yet they are often some of the most rewarding. So here’s a bit of help to understand Bordeaux and clear the path so you too can enjoy what this classic wine region has to offer. Wines are shaped in the vineyards and terroir (see Terms) is intrinsically linked in Bordeaux. Like most wine regions around the world, water plays a pivotal role in Bordeaux and it has a lot to influence it. Positioned alongside the Atlantic Ocean (the second largest ocean in the world), it is split right down the middle by the Gironde Estuary, hence the terms left bank and right bank (it’s that simple). The Gironde has very strong tidal currents (still navigable though) and stretches 50 miles in length before meeting the Dordogne and Garonne rivers downstream. It’s not too much of a shock then that Bordeaux has a maritime climate with temperate winters and long warm summers that help create ideal conditions to produce a variety of wine styles. The 2015 vintage saw some superb wines and even enabled other Châteaux to create their best ever wines! The weather can be savage though. Late frost wrecked havoc in Bordeaux in 2017 resulting in an overall and hefty 40% reduction in yield for the region. Certain Châteaux were far worse affected than others e.g. 90% of yield versus 0%. Some of those in the former subsequently chose not to make any wine at all e.g. Château Fieuzal in Pessac-Léognan announced they wouldn’t be making any red or white wine in 2017. Sad times and tough decisions. The total harvest in 2017 was 3.5m hectolitres, down 40 per cent on 2016….vineyards in Saint-Emilion had been the worst affected” said the Conseil Interprofessionnel du Vin de Bordeaux, CIVB. Bordeaux’s finest wines from the likes of first growths (see Classifications) Châteaux Latour, Lafite, Mouton Rothschild, Margaux and Haut-Brion can be initially sold en primeur (see Terms) and via the Bordeaux Négociants/brokers who sell them on to importers based around the globe. Yet there is a vast amount of other wines produced and many are not just good quality but great value too. 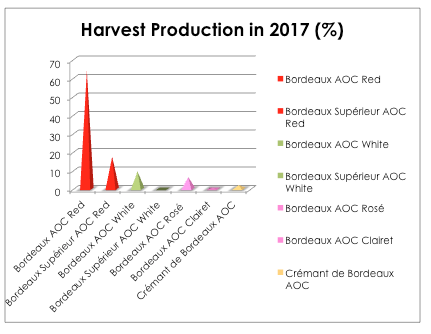 More than half the wines produced are the generic Bordeaux AC and Bordeaux Supérieur AC (see Classifications, Bordeaux Grapes and click on the Harvest Production table). The vast majority of Bordeaux wine is red, still (no bubbles), made from a mix of grapes and often referred to as a Bordeaux Blend or claret (see Terms). Playing a leading role is Merlot, Cabernet Sauvignon and Cabernet Franc with support from Carménère, Malbec and Petit Verdot. See Bordeaux Grapes. The soils typically dictate which grape is in the front seat. Put simply, Cabernet Sauvignon is characteristically dominant in the blend for left bank wines where the soils are commonly more gravelly, which it loves. These rich and powerful wines tend to be higher in tannin, acidity and alcohol with aromas and flavours of cassis, blackberry, black cherry, coffee, spice and liquorice. The more voluptuous Merlot takes centre stage in the right bank where the soils are more limestone clay, the soil it prefers. 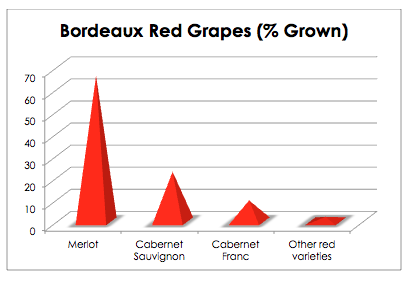 Percentages of Cabernet Sauvignon can vary dependent on the vintage though e.g. in poorer vintages where it can be very challenging to get the small thick berries of this very tannic variety to ripen fully, winemakers may choose to use less in the blend even if they are located in the left bank. Still white wines have grown in stature over the years thanks, in part, to some excellent assistance from Bordeaux University Institute of Vine and Wine Science (ISVV). Two ‘shout out’ regions for premium dry white wines are Graves and Pessac-Léognan (located within Graves) yet production isn’t very big. The vast majority of generic white wine is made in the Entre-Deux Mers as well as the Médoc, Sauternes and Saint-Emilion (the latter 3 under Bordeaux AC – see Classifications). These wines can come in a range of styles from fresh and fruity to rich and concentrated. Bordeaux is blend country although with the global popularity of Sauvignon Blanc (SB), there has been an emergence of some SB varietal wines. Whilst Bordeaux’s notoriety and lineage particularly radiates around its red wine, it has another jewel in its well-decorated crown. Sauternes (and Barsac) is a gift from God and pure nectar – if you’ve not tried it, you’re missing out. Made with botrytised white Bordeaux grapes, these deliciously complex honey, apricot, orange marmalade and blossom wines are sweet yet beautifully balanced by high acidity. Château d’Yquem sits firmly at the top of the tree! Great in combo with creme brûlée, Roquefort cheese, lemon tart tatin…. and the rather un-pc fois-gras. France’s Provence and Loire are more widely known for rosé wines yet Bordeaux make some pretty impressive versions too albeit on a small scale. Clairet, made from Merlot and Cabernet Sauvignon, is a more full-bodied fresh and velvety rosé with red and black fruit as well as peony floral notes. 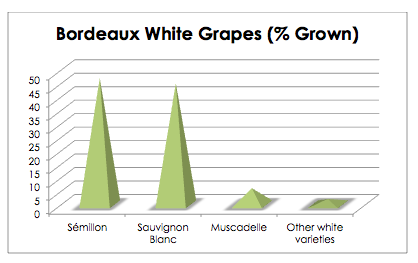 Although production is pretty minuscule proportionately to Bordeaux, it is on an upward trajectory. Crémant de Bordeaux, the newest AC in Bordeaux (established in 1990), uses AC permitted grapes varieties to make their white and rosé sparking wine. Like other Crémants, they have to be made exactly the same way as Champagne (i.e. hand picked grapes and produced via the Traditional Method) and aged for a minimum of 12 months. The emphasis of Bordeaux’s notoriety and infamy is clearly wine yet it is also a beautiful and historic Gallo-Roman odyssey for all your senses: fine wine with gastronomy, art, architecture, rivers and on and on it goes. The contemporary and ‘bond like’ Cité du Vin Wine Museum in Bordeaux opened its doors in 2016 and it surely has to be one of the world’s best wine museums. With an ‘immersive, sensorial approach’, we loved the awesome round Latitude20 wine shop (it stocks 14,000 bottles of 800 wines from an impressive 70 countries priced between €5-€50) and a mouth watering dining experience with a difference in the genuinely panoramic setting of Restuarant Le 7. Peaked your interested in Bordeaux? It’s easier to reach than perhaps you realise thanks to the new 188-mile stretch of high-speed track. You can jump on the Eurostar in London and with a quick change in Paris aboard the TGV you’ll arrive in Bordeaux in just over 2 hours! Go on, get cracking Bordeaux! !